Don't toss that marinade after you have used it; you can boil the marinade to reduce it and then use it as a sauce. The advantage of doing this is that the sauce will complement the layer of flavor that you have already created with the chicken marinade, as well as add additional moisture and texture to the meal. 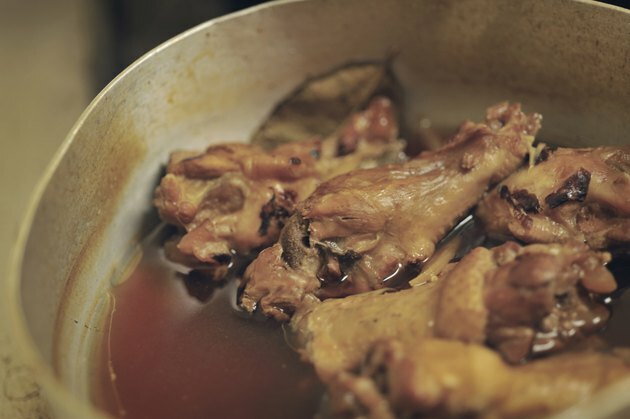 With a few simple precautions, such as boiling the marinade, it is perfectly safe to use the marinade to top the cooked chicken. Pour the used marinade into the saucepan and heat it over high heat. Bring the marinade to a rolling boil and allow it to boil for ten minutes before you reduce the heat to low. The heat will kill any bacteria present in the sauce. Add additional spices or salt to taste in the sauce. Remember that the sauce is the dish's final seasoning, so it may need additional flavor. Depending on the sauce, you might add salt and pepper, Cajun seasoning, thyme or even curry powder. Select a seasoning that will complement both the chicken and the flavors in the marinade or leave the sauce plain if it is already highly flavored. Whisk in 2 tsp. cornstarch and continue cooking the sauce over low heat until it has reduced to your desired consistency. Add more cornstarch if the sauce has still not reduced enough in five minutes. Boil the marinade for the full ten minutes. Improperly heated marinade can contain bacteria that can make you seriously ill or even be fatal.